Mixed Reality (previously called "Windows Holographic") blends virtual and augmented reality into hybrid environments where physical and digital objects coexist and interact. It is a platform in Windows 10 designed to power a range of VR and AR devices, which includes the HoloLens. 1. 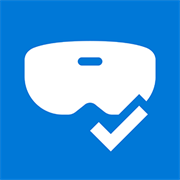 Open the Mixed Reality Portal app from your Start menu.